Most adults know one of the keys to good health and freedom from common ailments is the simple act of frequent and thorough hand washing. In an effort to install the same knowledge and practice in children, Kimberly-Clark has teamed up with Disney to promote its new Healthy Schools Project. The UK Department of Education has released figures showing that thousands of British children are absent from nurseries and schools each day due to minor illnesses. Many of these are spread due to poor hand hygiene. The project provides free resources and lesson plans about hand hygiene, allowing teachers to integrate them into the curriculum. 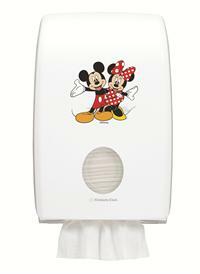 To get the message across in a cutesy way, Disney characters will be printed on hand hygiene dispensers and colourful posters designed for bathroom walls. Favourites including Mickey and Minnie Mouse, and Donald Duck will be featured. This child-friendly campaign aims to help teachers reinforce positive messages about the benefits of good hand hygiene while engaging children to take greater responsibility in washing their hands.